Make a quilt using 3 paint chip colors whose names begin with the initials of your name. 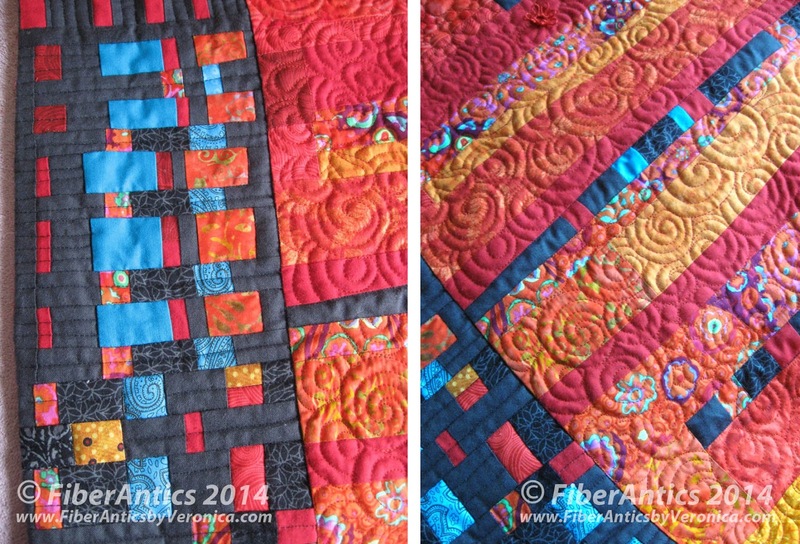 This was a parameter of my quilt guild's [the Choo Choo Quilters] Challenge this year along with a size guideline and a required hand technique. My guild had its Challenge reveal at the November guild meeting. 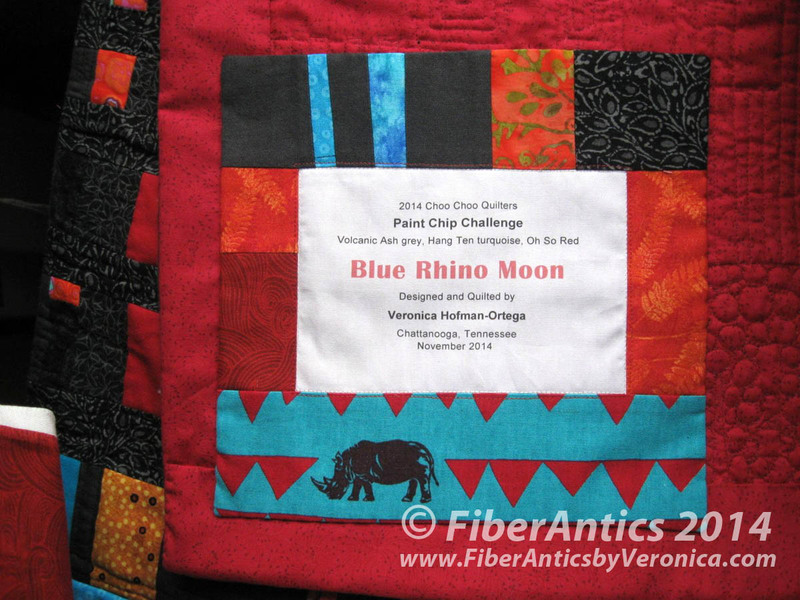 My entry, "Blue Rhino Moon," tied for the First Place prize. 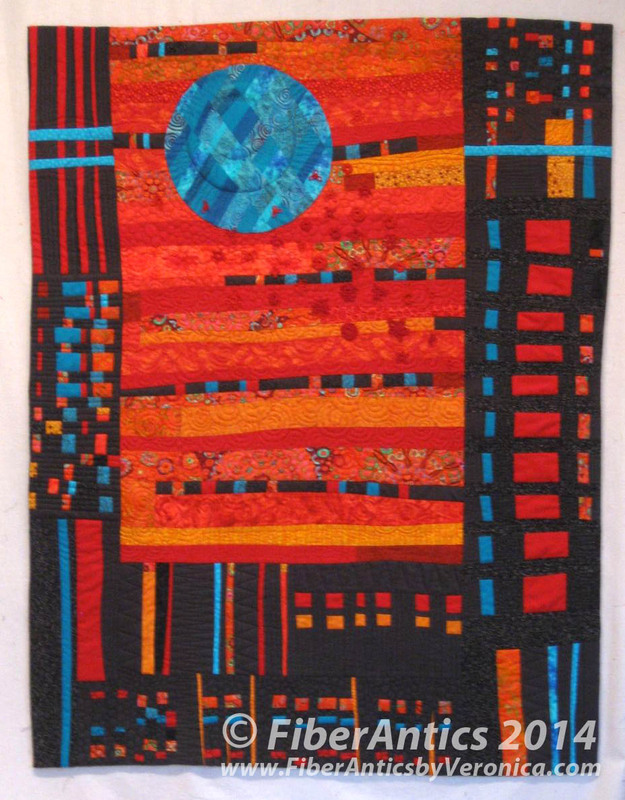 Check out the other fabulous quilts here. After sorting and purging a huge pile of paint chips, I focussed on these three colors: Volcanic Ash, Hang Ten (turquoise), and Oh So Red. 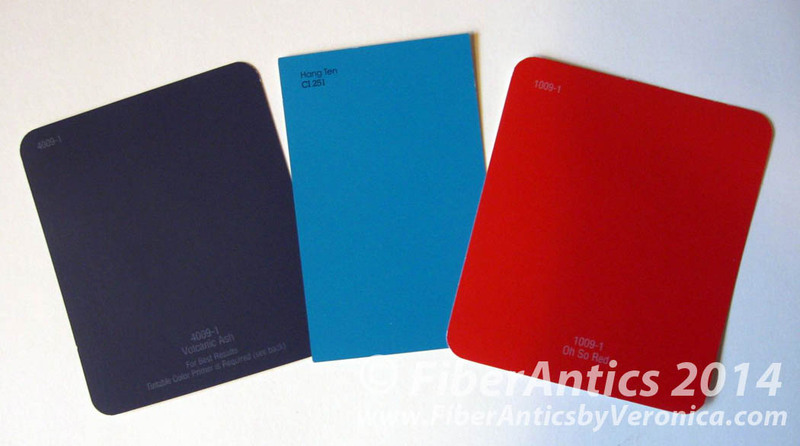 The charcoal gray offered a dark value that contrasted with the other two, near-compliment colors—(almost) blue-green / red-orange. VHO: Volcanic Ash, Hang Ten, and Oh So Red paint chips. Inspiration also came from a cotton/linen blend remnant from an Echino Decoro collection for Kokka fabrics. Kokka cotton/linen print was an inspiration. Since the focus of the Challenge was a color story—dictated by the paint chips—blender fabrics became indispensable in accomplishing the goal. Being tonal by nature, the eye is not distracted by a contrast in color and value that is found on coordinating prints or the variety of imagery on most focus fabrics. For my fabric rep compatriots, included in my Challenge piece are Splash, Crushed, Fusion and Just Color blenders and two colors from the Peppered Cottons blender line by Pepper Cory: 23 carbon and 16 flame. Carbon and Flame matched the Volcanic Ash and Oh So Red paint chips perfectly so they became predominant fabrics in Blue Rhino Moon. 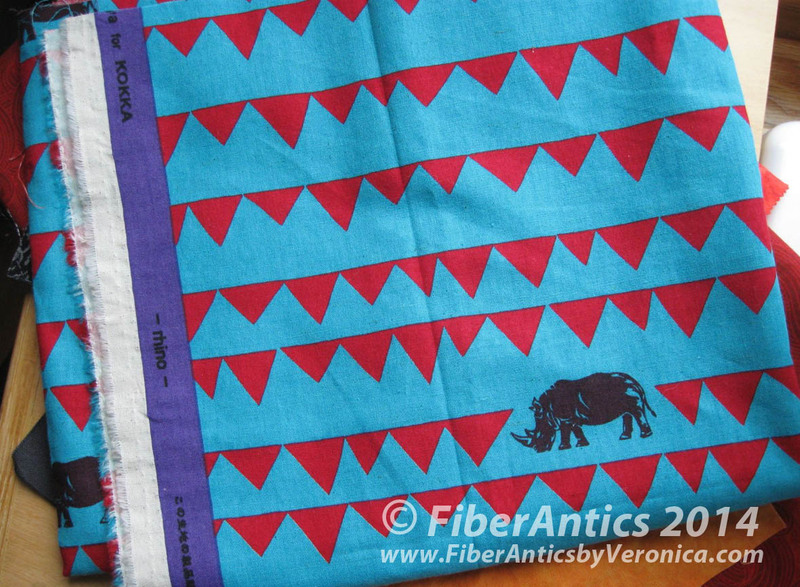 StudioE Fabrics were include in "Blue Rhino Moon." 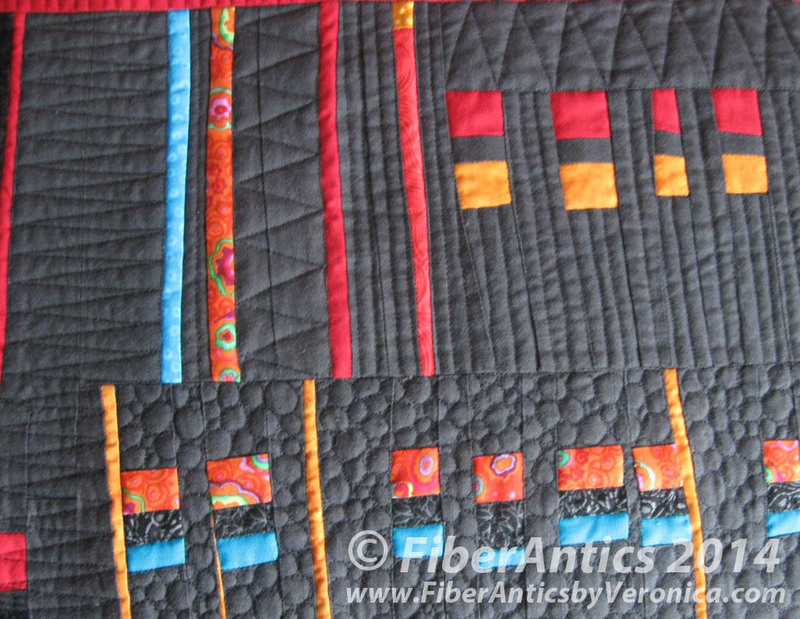 As many of you know, the [free-motion] quilting is one of my favorite aspects of the quilt-making process. 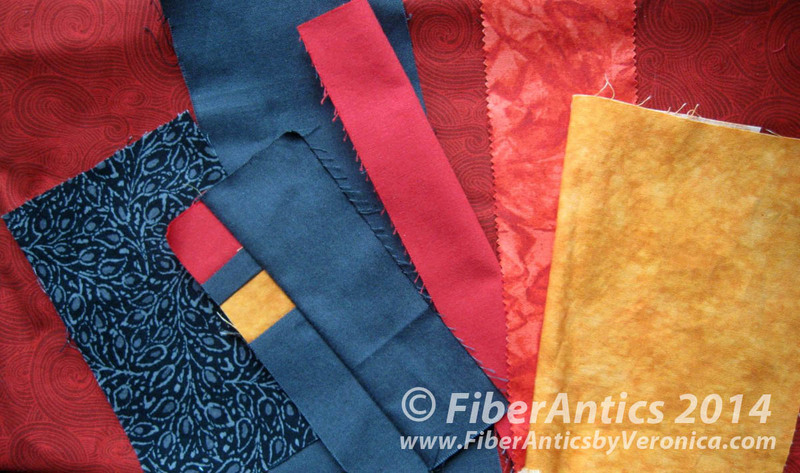 The yarn-dyed Peppered Cottons are wonderful to stitch and quilt! These shot cottons are almost solid so they show off the texture and bas relief created by the free-motion stitching quite nicely. Aurifil Mako 50 wt. cotton threads were conducive to quilting the background fills and zig-zags. 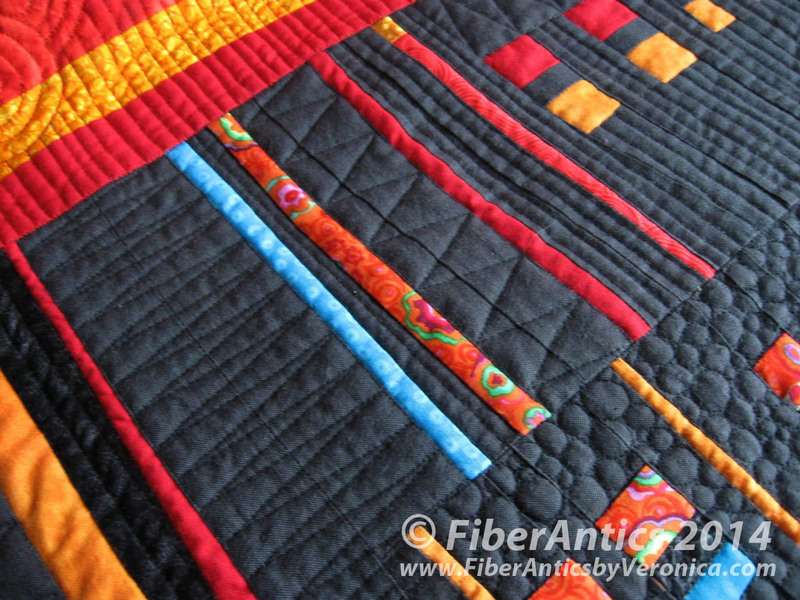 Free-motion quilting on Peppered Cottons. The handwork techniques that I incorporated were hand appliqué (the patchwork circle) and the addition of small surface embellishments that I needle-tatted and crocheted with perle cotton thread and cotton yarn. 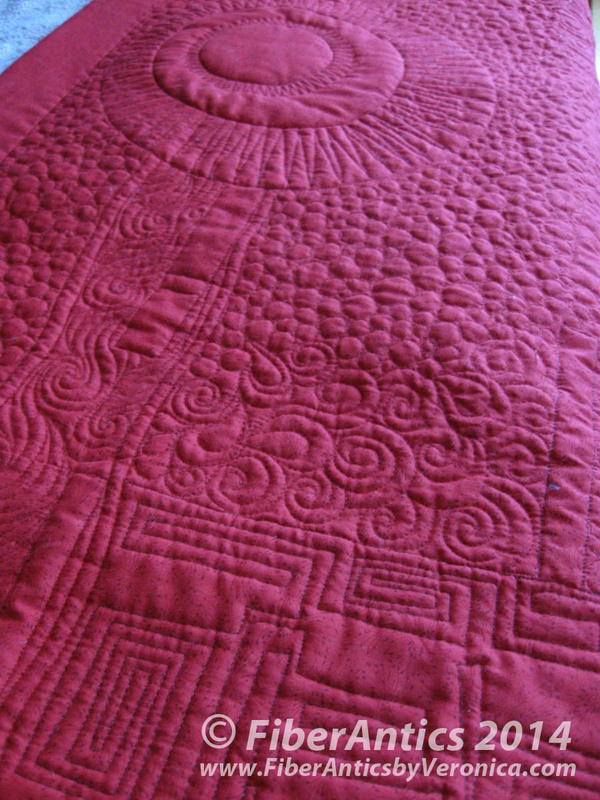 These motifs were hand sewn onto the quilt after it was quilted. Embellished with tatted and crochet pieces. 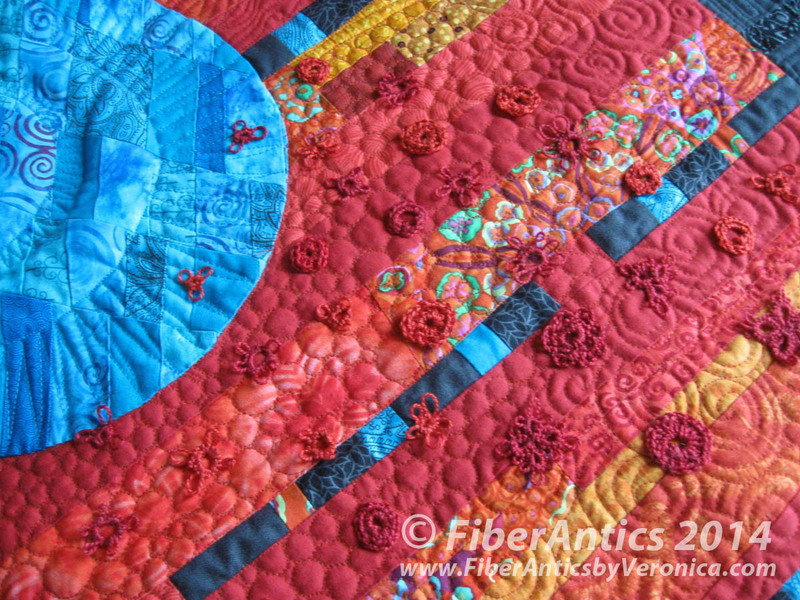 Trapunto was used in the blue appliquéd circle and the backing fabric is Sparkle cherry 108" by Blank Quilting (this fabric is no longer available). Sparkle cherry 108" wide backing. Finished size: 33.5" x 43.25"
Threads: Aurifil 50/2 cotton in the top and Superior Bottom Line in the bobbin. 16 hours of quilting. 4 bobbins. Batting: Hobbs Tuscany unbleached cotton with a piece of Tuscany polyester batting for the trapunto in the appliquéd circle. This piece has a faced binding. Many guild members commented how the caliber of our guild's Challenge pieces has elevated over the past few years. I couldn't agree more! See the other entries here. During the evening's presentation, each quiltmaker gives a brief overview of her processes, color choices and then the floor is opened up for a short, informal Q&A for each piece. It's interesting to hear each quilt's story unfold. We often laugh about when our guild members actually start working on their Challenge quilts. Most admit to a very recent date. Then, we all chime in, "there's nothing like a deadline!" Label for "Blue Rhino Moon"
My label (another Challenge requirement) was made from leftover patchwork bits and a strip from my inspiration fabric... with the rhino.